The story of DARPA’s work on experimental aircraft programs began quietly – with a strange airplane that, ironically, wasn’t designated an “X” plane. The QT-2 was the answer to a noisy problem. American and South Vietnamese troops in Vietnam fought primarily during daylight, while the opposition preferred to operate mostly under cover of darkness. To counter enemy activity, U.S. forces conducted nighttime reconnaissance and surveillance by air. But too often, flights after dark yielded little information. The engine noise of American aircraft gave the enemy advanced warning and they simply vanished into the night. To solve the problem, DARPA (then ARPA) provided funding to Lockheed Martin in April 1967 to develop an airplane that would be nearly silent. Lockheed came up with the “Quiet Thruster,” a small, odd-looking propeller-driven aircraft based on the Schweizer SGS 2-32 sailplanes (X-26As) that the U.S. Navy used to train novice pilots. The program yielded a prototype within six months. An engine mounted on the fuselage behind the cockpit drove a 10-foot shaft connecting to a four-bladed propeller on a pylon at the nose of the aircraft. Employing a heavily muffled engine exhaust and a very slow-turning propeller, the QT-2 was virtually inaudible flying at 1,000 feet – the world’s quietest airplane at the time. The follow-on YO-3A placed the engine in a more conventional location at the nose, and the U.S. Army ordered 14, 13 of which entered service. Humble as the little plane was, it might be considered an early venture into the development of stealth aircraft. The leap in capability produced by DARPA’s first X-plane program is emblematic of the agency’s approach to X-plane development. The former X-29 program manager explained that pushing boundaries is part of DARPA’s DNA. Some X-plane programs, like QT-2, have been striking successes, yielding new technologies and even aircraft that have directly influenced military aviation. Like the QT-2, some of DARPA’s most successful X-plane programs made little noise, at least initially. Have Blue, the prototype for the first stealth aircraft. Note the early inward-canted twin tails, later modified to outward-canted tails on the F-117. “Have Blue” was a proof-of-concept program launched in the early 1970s to achieve radar cross-section (RCS) reduction – an effort aimed at making it difficult for the advanced air-defense missile systems proliferating during the period to detect tactical aircraft. 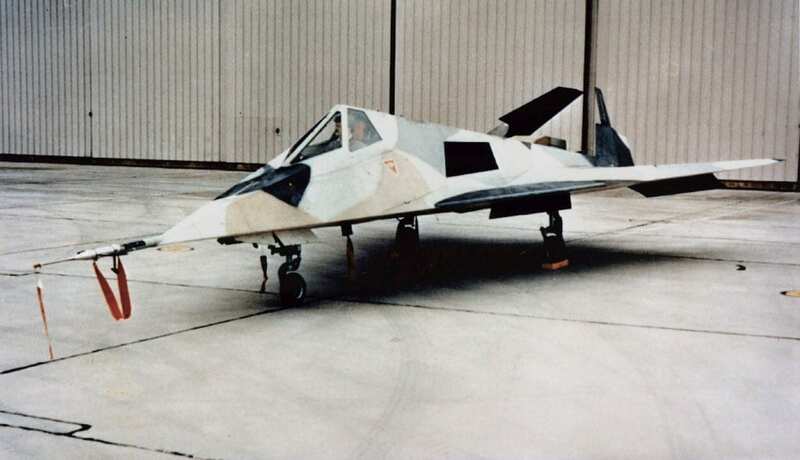 By 1977, the world’s first practical combat stealth aircraft flew as a DARPA X-plane. DARPA research supporting Have Blue enabled not only RCS reduction through “faceted” stealth shaping, but the development of radar-absorbent materials (RAM), visual-signature-reduction technologies, and jet-exhaust shaping and cooling as well as other infrared-shielding technologies. These DARPA efforts produced an aircraft that revolutionized tactical air power more than 40 years ago. Procured in secret by the U.S. Air Force, its distinctive angular dart shape would be developed into the famous F-117 Nighthawk stealth aircraft, which flew its first combat mission in 1989 and was one of the transformational technologies employed during Operation Desert Storm. During the same period, DARPA was secretly at work on second-generation radar cross-section reduction technology with “Tacit Blue,” employing curved surfaces and advanced materials. The resulting X-plane, nicknamed “the whale” and “Shamu” by program insiders, flew in 1982, and could operate radar sensors while maintaining a low RCS. The aircraft laid foundations for development of the B-2 stealth bomber that debuted in 1989. This second-generation stealth aircraft became operational in 1997 and flew its first combat mission in 1999. Tacit Blue employed second-generation stealth shaping and materials to enable a battlefield reconnaissance and surveillance aircraft to operate near the forward edge of the battlefield with a high degree of survivability. DARPA’s development of stealth revolutionized air warfare, and it is important to remember not only the initial shock the technologies caused, but that potential adversaries had no answer to stealth for more than three decades. The Su-57, Russia’s first stealth combat aircraft, first flew in 2010, and delivery to the Russian air force is not expected until 2019. China’s J-20 stealth aircraft likewise first flew in 2011, and entered squadron service just this year. That these nations took so long to develop their own stealth aircraft is a telling indication of just how giant a step the development of stealth represented. Less well known, but equally successful, was DARPA’s work on no-tail-rotor (NOTAR) helicopter technology. The agency’s support helped Hughes Helicopters mature the NOTAR concept and show its operational advantages with the NOTAR flying demonstrator in 1981. This led to a NOTAR series of military/commercial helicopters from McDonnell Douglas after it acquired Hughes Helicopters in 1984.